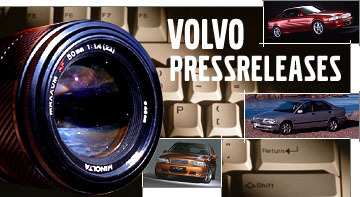 These are a selection of the press release issued by Volvo. They contain a wealth of information, both of a general and technical nature. Volvo On Call is a system that entails the introduction of advanced digital technology into ordinary cars. The system has been launched in the United States and Sweden and will be gradually introduced in other European countries. When the Volvo S80 was launched, it was the first car to have an expanded Multiplex electrical system. Multiplex means that computer networks replace the traditional electrical system, where different units communicate with one another. Volvo On Call is based upon communication between the car's Multiplex system and an integrated mobile phone, which in turn means that a new form of contact with the world at large is established. In the first stage, Volvo On Call is a safety and security system. However, it will gradually be developed into much more than that. The Volvo On Call system works as follows in its first stage: If the car is involved in an accident in which one or more airbags have been deployed, the Multiplex system registers this information and forwards it to the car's phone. If the Multiplex system is damaged in the collision, there is a back-up system, which sends a signal to the Volvo On Call system. The phone is in constant contact with a GPS unit in the car. Continuous information is received from this unit on the whereabouts of the car. When an accident has occurred, the phone automatically sends a text message of the exact location to a Volvo On Call alarm centre. At the same time, a voice line is opened between the car and the alarm centre. The operator at the alarm centre can learn about the situation over this line. In the event that nobody in the car is able to answer, the operator can call an ambulance, which thanks to the precise position-fix from the Volvo On Call system can be directed to the scene of the accident. In Europe Volvo On Call communicates over the GSM network. In the United States, where large areas of the country are without GSM coverage, the AMPS network is used instead. This network currently gives the best coverage. An assault alarm that can be activated manually. Rescue - help in alerting a recovery service if the car for some reason becomes impossible to drive. Tracking of a stolen car - the alarm centre can communicate with the car and obtain its position even if the phone is not switched on.This enables cars to be traced in the event of theft. Remote control via Volvo On Call can open the car doors if the keys have been locked inside or have been lost. The services available include an option to obtain traffic information, access to the Yellow Pages, and a navigational service, where the driver is given help in finding his or her way to the destination.